This sauna bucket comes complete with plastic liner for leak free use. The long handle on the ladle is ideal for scooping the water onto sauna rocks or cooling off he bathers. Check out the attention to detail! This hand crafted real cedar sauna bucket is manufactured by Northern Lights Cedar Products, a world leader in cedar products for the outdoor lifestyles. Included is a plastic insert liner that keeps the bucket from leaking and provides added hygiene when bathing in a sauna! The cedar bucket enhances the decor of any sauna! 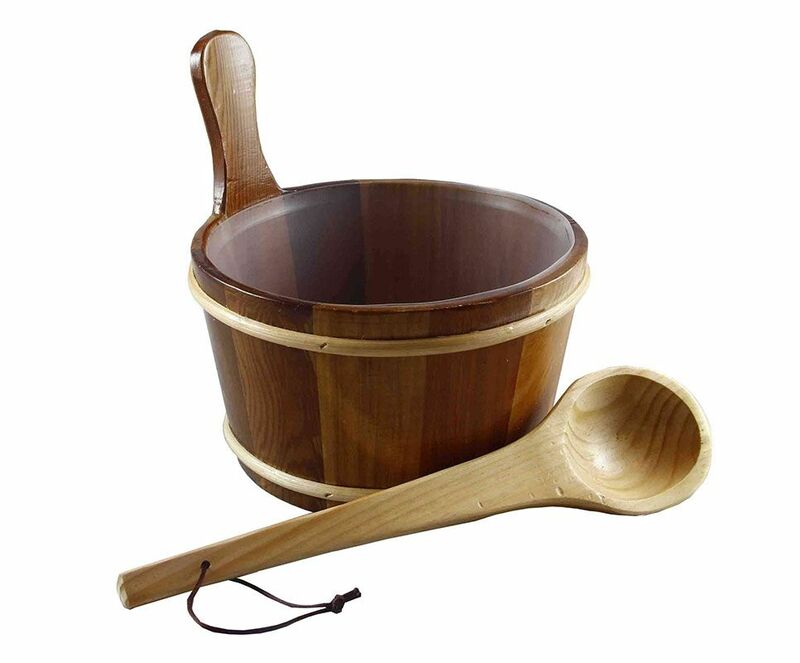 This sauna wood bucket holds approx 4 liters or 1.2 gallon and measures is 12" diameter. It features a carved wooden handle and a leather hanging rope for the ladle. All saunas should have a water bucket and ladle. Lightly scooping water on the body is a practice that goes back 1000's of years. The water causes the skin's pores to open, it also helps cool the body. The water can also be poured on the hot rocks to produce löyly (sauna steam). The löyly greatly helps the respiratory system.